Samuel Langhorne Clemens (a.k.a. 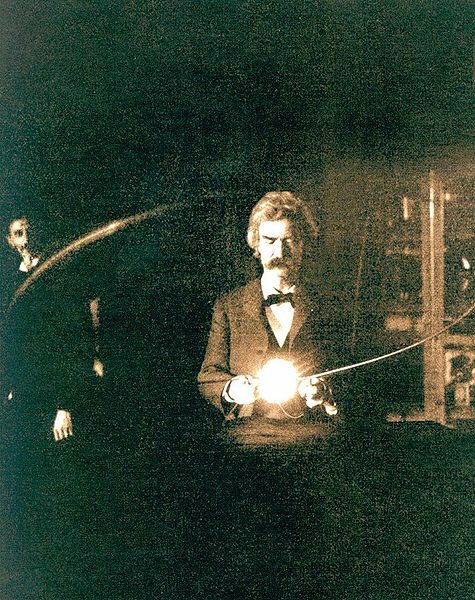 Mark Twain) in the lab of Nikola Tesla, spring of 1894. Thirty-one papers were presented at the thirty-first annual IEEE Symposium on Security and Privacy, held in Oakland, California (5/16/10-5/19/10); of those thirty-one papers, six were authored by CyLab researchers, offering powerful testimony to the relevancy of CyLab's research and its impact on current and future trends in security and privacy in cyberspace. "We present TrustVisor, a special-purpose hypervisor that provides code integrity as well as data integrity and secrecy for selected portions of an application." "The new protocols avoid the high computation overhead of one-time signatures and multi-receiver MACs, as well as the time synchronization needed by TESLA. In terms of rounds of complexity and communication congestion, our protocols provide points in the design space that are not achievable by previously published protocols." "The contributions of this paper are two-fold. First, we precisely describe the algorithms for dynamic taint analysis and forward symbolic execution as extensions to the run-time semantics of a general language. Second, we highlight important implementation choices, common pitfalls, and considerations when using these techniques in a security context." "We present the design and implementation of PCFS, a file system that adapts proof-carrying authorization to provide direct, rigorous and efficient enforcement of dynamics access policies." "This paper develops a parametric verification technique that scales even when reference monitors and adversaries operate over unbounded, but finite data structures. Specifically, we develop a parametric guarded command language for modeling reference monitors and adversaries." "In this survey, we organize and clarify extensive research on bootstrapping trust in commodity systems. We identify inconsistencies (e.g., attacks prevented by various forms of secure and trusted boot) and commonalities (e.g., all existing attempts to capture dynamic system properties still reply in some sense on static, load-time guarantees) in previous work." In addition to the six papers presented, two CyLab researchers (Jonathan McCune and David Brumley) chaired sessions, and a third, Collin Jackson, led a workshop.